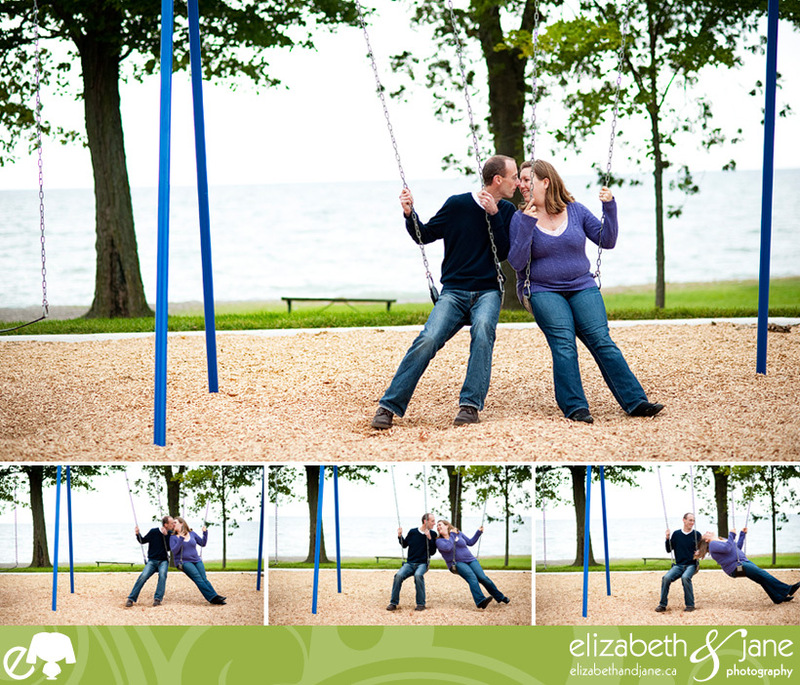 As I previously mentioned, Vicki and I went to University together, but what I didn’t mention was that she and I had many adventures into digital photography and did some crazy and fun projects together. One of those projects comes to mind and it was….well, unique. We were taking a class about something to do with body in performance. Actually come to think of it, I think that’s what it was called. Anyways, in taking a course about body in performance, you’d think you would be do projects about performance, but no, the professor wanted an essay. ugh. I’m really not an essay writer and neither was Vicki, so we came up with a diabolical plan to get out of the essay by doing a project based on a performance. What we came up with was Vicki would do a photo series and I would create a website. Now since this was university and we wanted good marks, we decided to be a bit “out there” with our project and decided it would be best if we dressed up as fairies. Yup. Fairies. We filmed each of us, dressed up as fairies, running around in one of the dance labs as well as had a studio photo shoot where we took photos of each other, dressed as fairies. 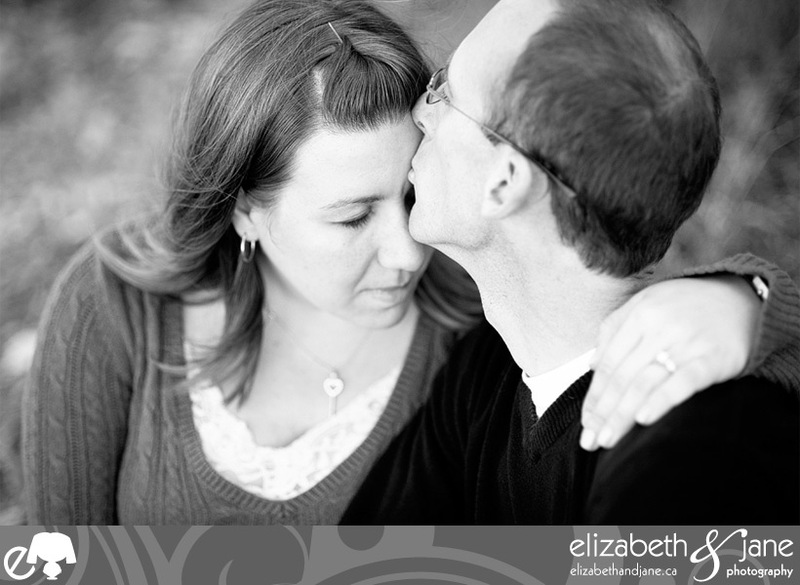 I then created a superawesome website and Vicki created a portfolio of the images. That story should tell you that Vicki is up for anything, so when I asked her and Matt to do things like lie in the grass, or jump up and down like crazy lunatics, they were all over it. 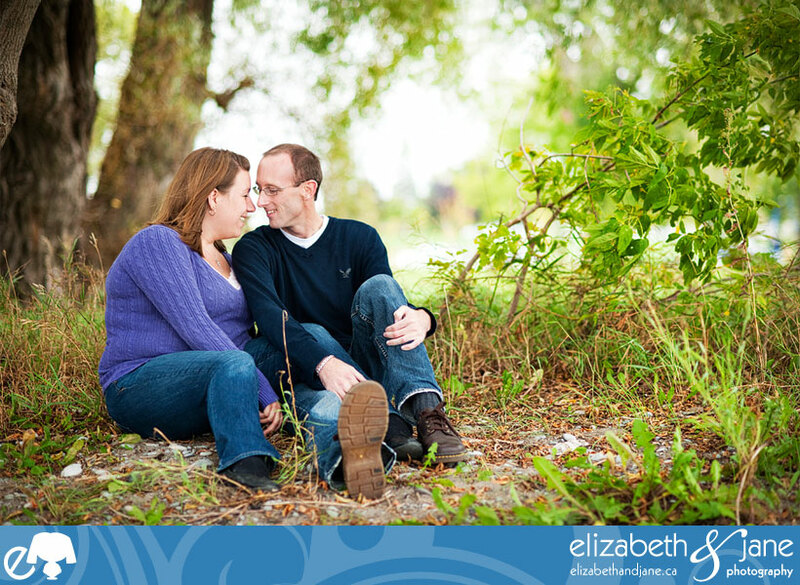 Matt is so wonderful and is a perfect fit for Vicki and I liked him from the moment we met at our consultation in April. After about two seconds, we were comparing what apps we had on our iPhones and making recommendations for various technologies to each other. Matt’s my kind of guy. 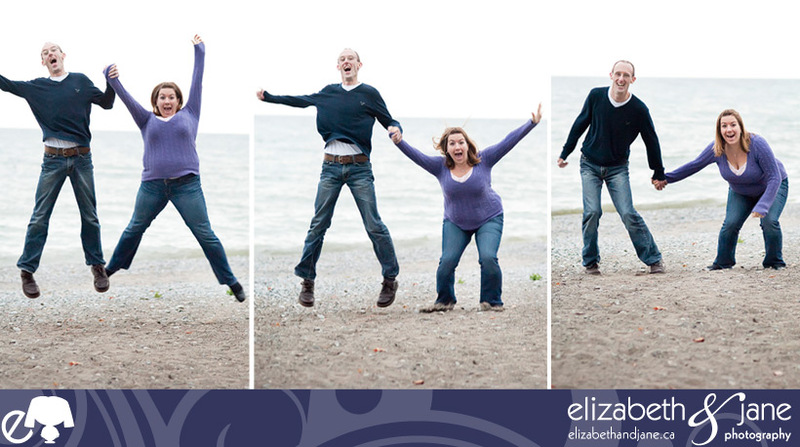 Vicki, Matt and I had such a blast at their engagement session. We were lucky enough to be shooting at the same location as their reception so as we walked and took shots, we came up with ideas for their wedding day photography as well. 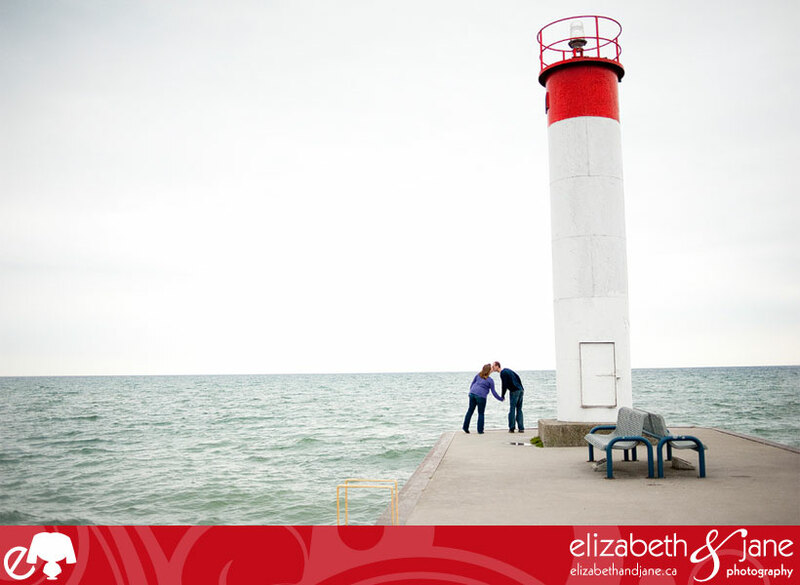 Their wedding is going to be held in Whitby, Ontario. 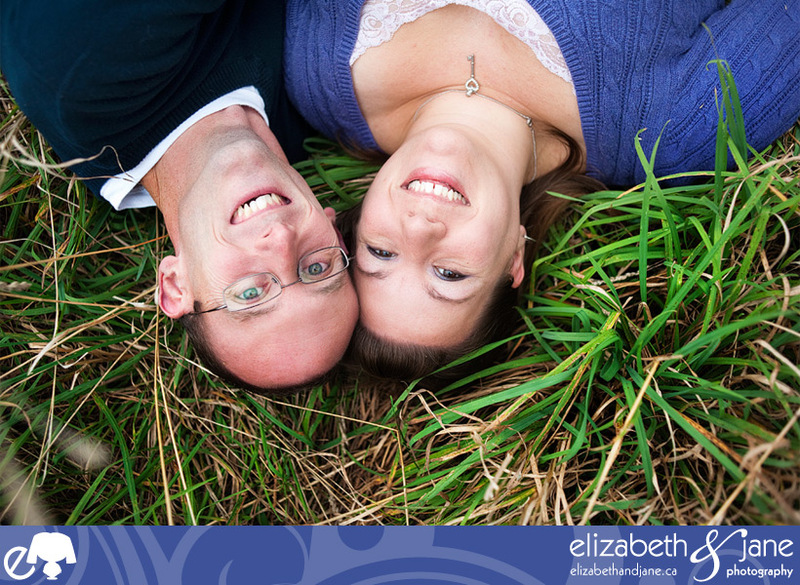 Thank you Vicki and Matt for choosing me to be your wedding photographer. I cannot wait for the big day next summer. The aforementioned lying in the grass shot. We searched up and down the shore for a heart shaped rock. I think we found a pretty good one! 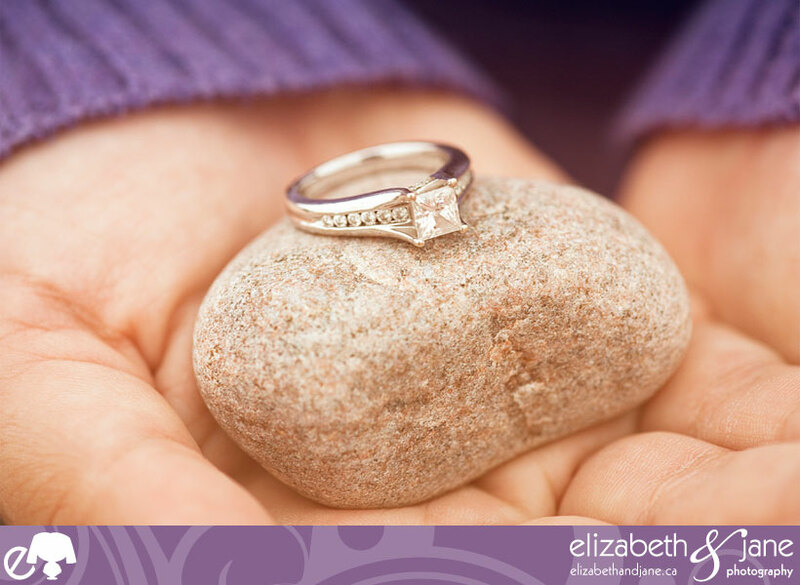 Matt did a fantastic job picking out Vicki’s gorgeous engagement ring. Some lovey beach shots. I can’t wait to do some wedding lovey beach shots next summer! There is something about this shot that I am just so in love with. I heart romantic shots. 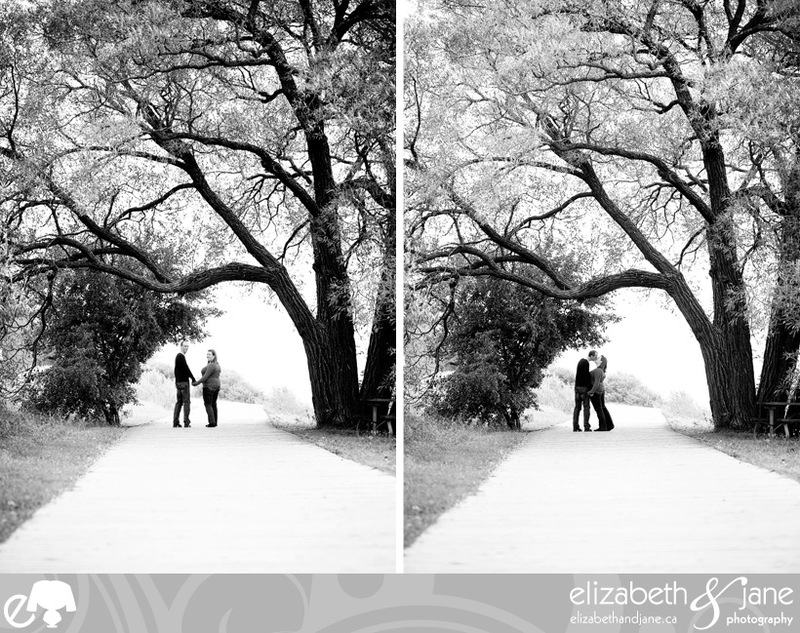 Especially black and white romantic shots! So there is a story behind the next few shots. On the land where we were having their engagement session, there is this old run down building that is amazing. It’s overrun with weeds and all sorts of greenery and has brick that’s falling down. Amazing. The only thing is that it’s fenced off. 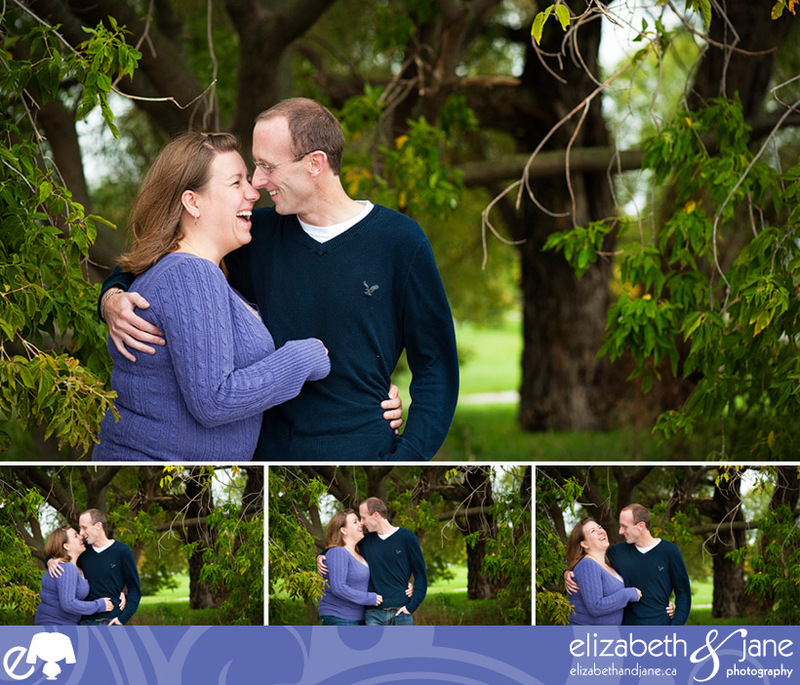 Well, leave it to Vicki to find a wee gap in the fence and we squeezed in and shot inside the fence! It was a photographer’s dream in there and I am so happy that Vicki and Matt were up for some adventure to get in there. Needless to say, the shots are awesome. We then took over the kids playset and had some fun. 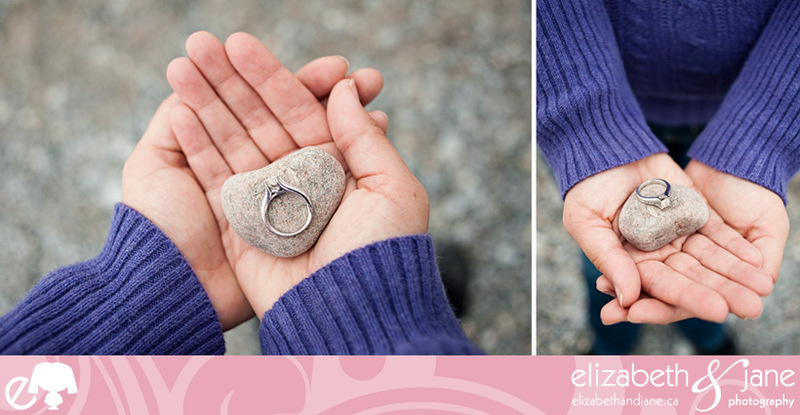 These are two of my favourite shots from the session which we are planning on recreating on their wedding day! I love these shots, they just make me laugh. Great job! Bet their wedding will be a lot of fun too! Wonderful site! I love the commentary. Funny, Vicki never told us about the university fairy escapade (or that you both got 100%)!!! Can't wait to compare with the wedding shots. Great job Liz!! They are so crystal clear and polished. Can't wait for the wedding!